1.1 Why “Quantitative” Scanning Probe Microscopy? 1.2 What is Scanning Probe Microscopy? 2.1 Few Components for the Price of a House? 6.1 What About Forces in Force Microscopy? 7.1 What Opposes the Tip Motion? 8.1 What is Above the Sample? See the Invisible! 11.1 Really a Hot Topic? 13.1 Morphology, Tip-Sample Artifacts, etc. Accurate measurement at the nano-scale – nanometrology – is a critical tool for advanced nanotechnology applications, where exact quantities and engineering precision are beyond the capabilities of traditional measuring techniques and instruments. Scanning Probe Microscopy (SPM) builds up a picture of a specimen by scanning with a physical probe; unrestrained by the wavelength of light or electrons, the resolution obtainable with this technique can resolve atoms. SPM instruments include the Atomic Force Microscope (AFM) and Scanning Tunneling Microscope (STM). Despite tremendous advances in Scanning Probe Microscopy (SPM) over the last twenty years, its potential as a quantitative measurement tool have not been fully realized, due to challenges such as the complexity of tip/sample interaction. 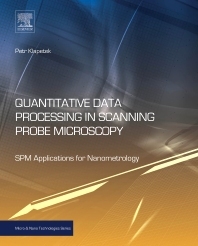 In this book, Petr Klapetek uses the latest research to unlock SPM as a toolkit for nanometrology in fields as diverse as nanotechnology, surface physics, materials engineering, thin film optics, and life sciences. Klapetek's considerable experience of Quantitive Data Processing, using software tools, enables him to not only explain the microscopy techniques, but also to demystify the analysis and interpretation of the data collected. In addition to the essential principles and theory of SPM metrology, Klapetek provides readers with a number of worked examples to demonstrate typical ways of solving problems in SPM analysis. Source data for the examples as well as most of the described open source software tools are available on a companion website. Unlocks the use of Scanning Probe Microscopy (SPM) for nanometrology applications in engineering, physics, life science and earth science settings. Provides practical guidance regarding areas of difficulty such as tip/sample interaction and calibration – making metrology applications achievable. Gives guidance on data collection and interpretation, including the use of software-based modeling (using applications that are mostly freely available).